Biologically it is one of the more diverse and important areas in the entire Yellowstone ecosystem. The range is critical habitat for grizzly bear, lynx, wolverine, bighorn sheep, and other rarer mammals. In addition, the lower elevations sustain thousands of wintering elk and an important migration corridor. Indeed, the Montana Natural Heritage Program lists 18 birds, 8 mammals, 3 fish, 3 amphibians, and 1 reptile as “at risk” or declining in numbers, demonstrating the need to provide the strongest protection possible for this area. A debate exists among conservation advocates over the best way to protect the rich biological heritage of this landscape. Wilderness designation is the “Gold Standard” for land protection. By permanently removing designated wilderness from commercial development like logging, mining, and oil and gas, as well as mechanical access, the Wilderness Act is the best strategy for long-term protection of any landscape. Since 1977 155,000 acres have been given partial protection as the Hyalite-Buffalo Horn-Porcupine-Wilderness Study Area (HBHP) in the Montana Wilderness Study Act S. 393 legislation. The WSA is about 2/3 the size of Montana’s Scapegoat Wilderness Area 155,000 acres versus 239,936 acres. With the Custer Gallatin Forest Plan Revision, there is an opportunity to permanently protect this critical landscape under the auspices of the 1964 Wilderness Act. A collaborative called the Gallatin Forest Partnership (GFP) is calling for partial protection of a little more than 100,000 acres of the 230,000 acres that could be designated wilderness in the range. The GFP proposal is not as good as wilderness designation in terms of its ability to protect the mountain range’s outstanding biological/ecological values. Their proposal is a good start in addressing the long-term protection of the range, but it leaves two critical areas out of the wilderness proposal: Buffalo Horn-Porcupine and West Pine. The GFP proposal calls for designation of the Buffalo Horn Porcupine Area and West Pine Creek areas as “Wildlife Management Areas.” Among the problems with such designations is that unlike wilderness which is time-tested and legally tested, there is no legal precedent for such designation. Though their proposal lays out specific limits on some recreational use, we do not have the assurances that these can be and will be enforced. 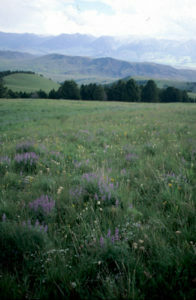 The Buffalo Horn and Porcupine area, adjacent to Yellowstone National Park, is a very important elk migratory corridor, elk winter range, and grizzly bear habitat. It also offers good habitat for bison, and currently supports bighorn sheep, wolves, and wolverine. The second area in West Pine which shares the northern edge of the range with the highly impacted Hyalite area. West Pine offers the only migration corridor that could effectively connect the Gallatin Range to the Bridger Range to the north. 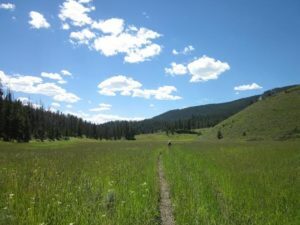 Given the high recreational use of the Hyalite area, reducing recreational impacts in West Pine is critical if a connection route between the Gallatins and Bridgers is to be maintained. If for no other reason West Pine should be protected as designated wilderness as well. In the northern portion of the Gallatin Range, the GFP proposes a Hyalite Watershed Protection and Recreation Area that would essentially make recreation the primary use of this area. Given the existing heavy roading in this drainage and its proximity to Bozeman, and the Hyalite Reservoir which serves as the city’s water supply, there is less opportunity for wilderness designation, though a few drainages like South Cottonwood, and other roadless lands surrounding Emerald Lake, Divide Peak and Maid of the Mist that could and should be designated wilderness. Most of the opposition for protecting this entire roadless area as wilderness comes from mountain bikers as well as some motorized groups. In the past, most of the threats to the Gallatin Range ecological integrity came from logging. But most the range’s accessible timber has already been removed. Checkerboard land ownership resulting from old railroad grants, particularly in the Buffalo Horn Porcupine area, hindered uniform management. However, this was resolved with land trades that enabled the creation of Big Sky Resort. It was the viewpoint of conservationists at the time of these trades that Big Sky would be a “sacrifice” area, while the Buffalo Horn-Porcupine area would be the “safe” zone eventually to be protected as wilderness. That assumption of landscape protection by wilderness designation is being undermined by the Gallatin Forest Partnership’s proposal for “Wildlife Management Areas” that would allow, among other things motorized recreation and mountain biking. Their wildlife management proposal calls for no “commercial logging” but the FS almost never logs today for “commercial” production, rather “forest health” and “fire preventions” are the reasons given for logging, and this is not expressly prohibited by the GFP agreement. The biggest problem, however, comes from increased mountain biking and other recreational use. There is overwhelming evidence that all recreational use can negatively impact wildlife. However, not all recreational use is equal. Mechanical access including mountain biking can increase displacement and stress for sensitive wildlife more so than hikers. You can read Craighead’s detailed research paper here: http://www.craigheadresearch.org/wilderness-study-areas-and-wildlife.html and much of what follows is drawn from his report. Another study found that elk increased their travel time during most disturbance, which reduced time spent feeding or resting. Elk travel time was highest during ATV exposure, followed by exposure to mountain biking, hiking, and horseback riding. Elk reacted negatively to ATV traffic at distances up to 1,000 meters and had a high probability of fleeing if they were near an ATV trail when ATVs were detected. It appeared that elk would habituate to horse backriding, but not to mountain biking. A literature review in 2009 reviewed impacts on 21 wildlife species in Mount Spokane State Park in Washington and documented studies that found impacts on elk and wolverine among other species (Snetsinger and White 2009). The mere presence of trails negatively impacts 14 of the 21 species, and areas of concentrated recreation/recreational development negatively impacted an additional 7 species. Herrero & Herrero (2000) studied the incidence of conflict/interaction between humans and grizzly bears (Ursus arctos horribilis) along the Moraine Lake Highline Trail in Banff National Park. They found that, though intensity of use was much lower for mountain bikers than for hikers along this trail, mountain bikers accounted for a disproportionately high incidence of conflict with bears. What all this suggests is that if conservationists wish to protect the biological diversity and incredible wildlife attributes of the Gallatin Range, designation of this entire roadless area as wilderness is the only logical choice. Other proposed designations like Wildlife Management Area or some other name are halfway measures that will result in half-way protection compared to wilderness designation. If we can’t protect the most biologically critical lands in the Gallatin Range, then where? What kind of legacy do we pass on to future generations? Are we mature and self-disciplined enough to say we need to give Nature first consideration?